Docker is very popular container technology. Docker is supported by Linux distributions and Windows operating systems. While using containers we may need to remove all container images from docker engine. 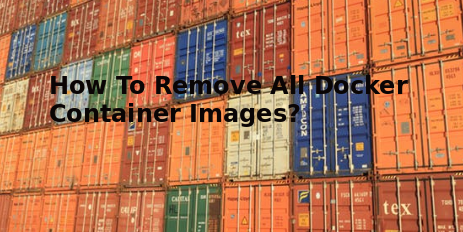 We will look different ways to remove all docker container images in this tutorial. Before removing images we generally need to list existing images to be sure. This is a safety step to prevent catastrophic actions like checking before dd command. We will use sudo docker images . We use sudo because we need root privileges or be in docker user group. Containers are instances created from the images. We can delete these instances or container images. We will use docker ps command to list them and provide their UID to the docker rm command which will delete given container. As we can see that deleted container UID is printed to the terminal output. Images are pure data about the starting point of the containers. We generally download images from docker hub or create them and store for daily usage. If we do not need them we can delete then with docker rmi command but we should provide images UID with the docker images command like below. If there are some issues while deleting docker images and volumes we may need to force them for removal. We will use -f option to for remove all docker images and containers. We will also use -v option for verbosity in conjunction with -f .
Docker engine is an intellygent mechanism where is monitors image and volume usage. Most of the cases there will be unused images and volumes where they take storage. We can use system prune to remove unused images and volumes. We can also put this command into cron to made it automatic.